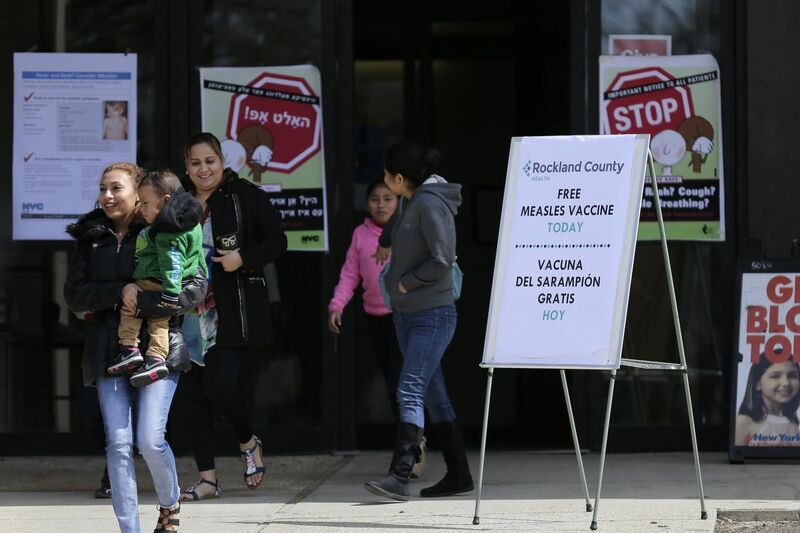 Sign advertising free measles vaccines and information about measles are displayed at the Rockland County Health Department in Pomona, N.Y., Wednesday, March 27, 2019. The county in New York City's northern suburbs declared a local state of emergency Tuesday over a measles outbreak that has infected more than 150 people since last fall, hoping a ban against unvaccinated children in public places wakes their parents to the seriousness of the problem. Last year was a big one for measles in the United States. This year is setting up to be even bigger, according to the Centers for Disease Control and Prevention. We’ve already seen notable outbreaks nationwide, including in New York City, Washington state, and New York’s Rockland County, which on Tuesday declared an emergency blocking children and teenagers not vaccinated against measles from public places. Indeed, every year since 2000, when measles was declared eliminated in the U.S., a traveler has brought measles from elsewhere. News reports and editorials that mention the elimination of measles make it sound as if we had reached zero cases, but now, these reports suggest, because of dangerous anti-vaxxer parents, we have hundreds. But that’s not true. There have always been some cases in this country. Pretending otherwise provides grounds for unfairly vilifying non-vaccinating parents. With tens of thousands of cases in Europe and elsewhere, it’s no wonder we have some outbreaks in the U.S. They have occurred in diverse communities, including Orthodox Jews, the Amish, and Somali immigrants, among others. This fact suggests that vaccination concerns are varied, not limited to the monolith of “anti-vaxxers” often portrayed in media. Some of these people may only be “vaccine hesitant” — reluctant to give their children multiple vaccines at once, for example, or fine with the vaccines given to infants but unsure of the flu option, as my research found in Virginia. Other parents choose illness over vaccination because they think it will produce a better immune response; still others see vaccines as riskier than disease, a view vehemently opposed by mainstream medicine. All vaccines have some risk. If that were not true, there would be no National Vaccine Injury Compensation Program, no reduced liability for pharmaceutical companies through that program, no special arm of the U.S. Court of Federal Claims (the Vaccine Court) to settle claims of vaccine injury, and no Vaccination Information Sheets mandated by the federal government to inform parents and vaccine recipients of possible adverse reactions. Yet vaccines pose little risk to most individuals because that risk is spread throughout the population. Millions of people get vaccinated, so any one individual’s risk of a bad reaction is small. But ask parents who believe that their child has been injured by a vaccine whether that matters, and they would say that a hypothetically tiny risk feels big if it is your kid. Telling parents their lived experience is wrong doesn’t get you anywhere. Moreover, forcing parents to vaccinate their children in the face of their deeply felt concerns may not be good public health policy or practice. For one thing, it’s not clear that further restricting exemption from state school-entry vaccination mandates will quell the concerns of vaccine skeptics or improve this country’s excellent vaccination rates. For example, in 2016, national coverage for vaccines against polio, measles/mumps/rubella (MMR), hepatitis B, and diphtheria, tetanus, and acellular pertussis (DTaP) were over 90 percent for children aged 19 to 35 months. In Pennsylvania, vaccines for DTaP, polio, MMR, hepatitis B, and varicella are required for school entry, with follow-ups in later grades for certain illnesses. Pennsylvania is one of 17 states that grant philosophical exemptions, along with the religious exemptions allowed in 47 states. Across the U.S., mandatory vaccination has struck a delicate balance between personal freedoms and government requirements, echoing dominant themes in our history. Exemptions to school-entry mandates serve a social and political function. Nonmedical exemptions allow personal beliefs to matter. In doing so, they avoid forcing people to act against those beliefs and so prevent the ill will that stems from that pressure. Nadja Durbach writing about compulsory smallpox vaccination in Britain at the turn of the 20th century shows that legalizing conscientious objection largely deflated the anti-vaccination movement, avoiding social unrest. Yet public conversations about vaccination — largely in the media, but also in the halls of Congress and in statehouses — often sidestep the crucial issue of personal belief by characterizing all vaccine dissent as wrongheaded and antiscience. The argument goes something like: Vaccines don’t cause autism (because science has debunked that myth), benefits override the risks (because the risk per person is low), parents shouldn’t consult the internet (because they can’t identify fraudulent sources), and people shouldn’t let their refusal to vaccinate endanger others (especially those with compromised immune systems, including children and people with chronic illness). Therefore, vaccine mandates should be strengthened (because people should be forced to do what is right). That framing is a problem. While scientific data certainly offers us crucial information about how to live good lives, science is not the only knowledge that influences our lifestyles, decisions, and values. If scientific data were somehow always absolutely correct and appropriate to each situation, we would not need science and health policies to help us decide how to deploy those facts for the public good. We would not need the many federal advisory committees whose job it is to make recommendations based on scientific evidence and other matters — including ethical concerns, resource availability, and public sentiment. And, of course, sometimes vaccines don’t quite work as promised. In Philadelphia, the outbreak of mumps at Temple University is a case in point — the affected students may have received MMR vaccines as infants, but mumps vaccine coverage wanes over time, leaving young adults vulnerable to illness later when they live in close quarters. To reframe our current conversations about vaccines, we could look at public controversies as opportunities to revisit the bonds that hold us together as communities. We could consult experienced public health authorities, who understand that trust in government workers is one of the most important elements in managing an outbreak. We could do the hard work of understanding other people’s views rather than pigeonholing them in convenient categories. We could stop talking about “those other people” who are crazy, dangerous, stupid, and duped. Or we could continue as we are, flinging accusations and getting nowhere with our mutual concerns about the health of ourselves, our children, our communities, our nation, and our world. Bernice L. Hausman is chair of the department of humanities at Penn State College of Medicine and the author of the book Anti/Vax: Reframing the Vaccination Controversy, which will be published by Cornell University Press on April 15.